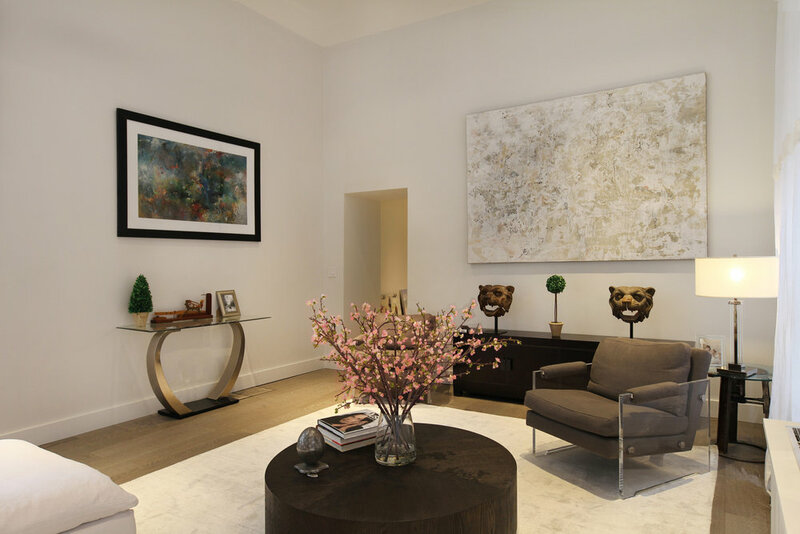 Residence 3D at the Abbey Condominium is a stunning two-bedroom, two bath with dramatic 14ft ceilings and an abundance of space for living and entertaining. Entering the residence, the first of two nicely appointed bathrooms—this one featuring ash gray marble floors and an under-lit sink—adjoins a lovely guest bedroom to the left. An entrance hall leads to the spacious and airy living-room. This open and welcoming space boasts views of the Church clocktower to the East and is flooded with sunlight throughout the day. A sleekly designed chef’s kitchen, featuring top of the line Miele appliances, Siematic cabinetry, under counter washer/dryer and Compaq quartz countertops, is sure to please the most discerning of cooks. The luxurious master suite features Easterly exposures featuring views of the St. George Church and ample closet space. The en suite master bath is outfitted with his-and-hers sinks, radiant heat Bella Carrara marble floors and custom double vanity with hidden Bluetooth speakers. No detail has been overlooked in this unit, from quiet-close drawers to 7” rift and quarter sawn oak floors, throughout. This really is a one of a kind showplace in one of New York’s most coveted and historic buildings. Approximate sf. : 1,421 sq. ft.